it most certainly is and Au has some wonderful "castles" there! Au, I just have one word to say " LEGEND ! " A very well chewed castle! He has MAD customization skillz! Awww...love these pictures. He looks so happy. I love boxes too, any box, even those that are too small. I can see he really enjoys them! WOW AU! Yous my hero!!! What can I say Au? You have wonderful ID skills. Pawsome.... purrr....meow! au: you wassup homie! Diggin' your new crib !! You sure know how to decorate your boxes Au! A cat can never have too many boxes. OMC, the mom is laughing her head off! 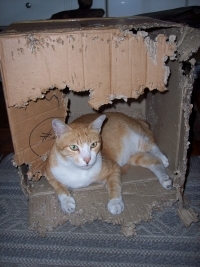 When Nicki has a box, he "eats" it like too, but he's never had one out long enough to do the fine job that Au has! What pawsome boxes you have! now that's a box put to a good use! Izz not kassle. Izz cave. Cave Kitty put the bitey on big nasty feet coming near cave.